by Brianna Crandall — February 4, 2019 — Sharp Imaging and Information Company of America (SIICA), the business product division of Sharp Electronics Corporation (SEC), has just announced the addition of four new models to its award-winning line of Sharp 4K Ultra-HD resolution commercial LCD displays designed to “help you communicate, collaborate and disseminate information brilliantly.” Sharp also announced three new space-saving desktop monitors. The new 43″ Class (42 ½” diagonal) PN-UH431, 50″ Class (49 ½” diagonal) PN-UH501, 55″ Class (54 5/8″ diagonal) PN-UH551 and 86″ Class (85 5/8″ diagonal) PN-UH861 display join the 70″ Class (69 43/64″ diagonal) PN-UH701 and 60″ Class (60 5/64″ diagonal) PN-UH601 commercial displays that were launched last year. A recipient of the InfoComm 2018 Best of Show award from Sound and Video Contractor, the displays are intended for hospitality, business and retail settings looking to excel at reaching their audiences. The true-to-life precision of 4K Ultra-HD resolution enables customers and viewers to see subtler textures and finer details in photos and video, says Sharp. The PN-UH series of displays features a powerful RS-232C command set that permits flexible remote-control capabilities from connected devices. It also comes with lockout capabilities including a public mode function for environments that require more control over the content, such as airports, stores and restaurants. The displays are built with a large screen and slim bezel to ensure a pleasing appearance and minimal protruding parts, while still allowing for enhanced connectivity. Additionally, two HDMI inputs allow you to connect multiple high-definition (HD) sources, including digital signage and cable boxes, while a built-in USB port lets you present a variety of digital content. These models come with Sharp’s Limited Three-Year Advance Exchange Commercial Warranty. We are very pleased to offer our largest line of commercial 4K Ultra-HD displays to date. The broad range of screen sizes ensures that our customers can now employ uniform technology and imagery in a variety of locations and environments to suit individualized business needs. Their customers will be more informed, entertained and engaged than ever before. 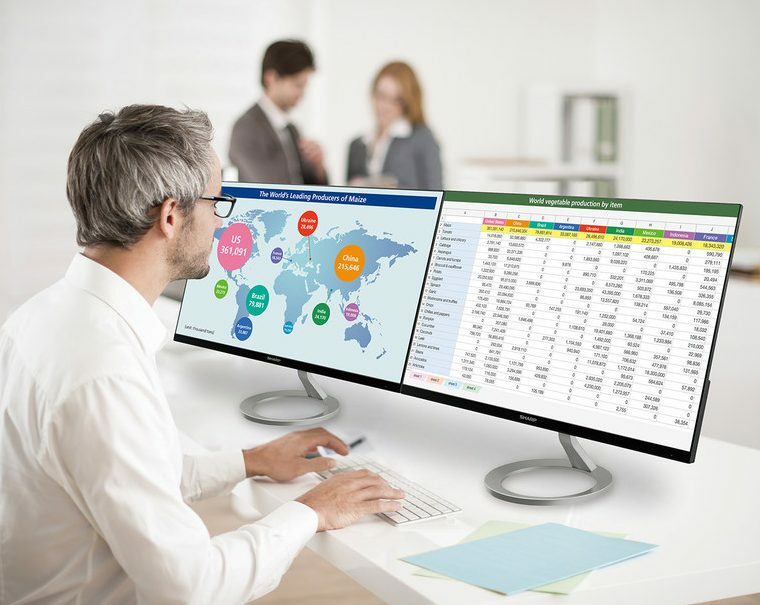 Sharp also announced three new space-saving desktop monitors for the modern, compact workplace: the 22″ Class (21.5″ diagonal) LL-B220, 24″ Class (23.8″ diagonal) LL-B240 and 27″ Class (27″ diagonal) LL-B270. A wide-viewing angle of 178 degrees allows users to see high-quality images with minimal alternations to color and brightness, and look consistent across the whole screen even when viewing from the side, says Sharp. Users can also manually adjust blue light output to one of four levels to find the most comfortable light level for their eyes. The LL-B240 and LL-B270 are available to ship immediately. The LL-B220 display is slated to become available to ship in February 2019. Sharp Electronics Corporation is the US subsidiary of Japan’s Sharp Corporation, a worldwide developer of home appliances, networked multifunctional office solutions, professional displays and energy systems. 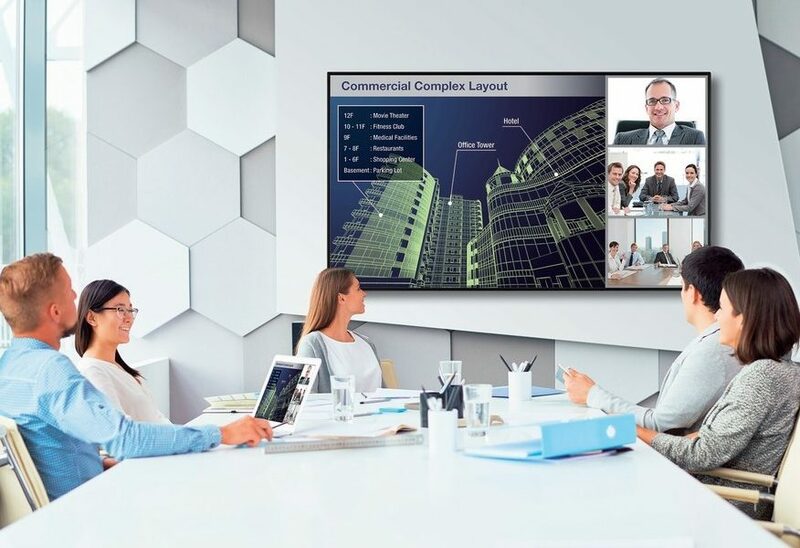 If you want to know the best lighting and setup for videoconferencing rooms, read this new IES/AVIXA standard November 16, 2018 In "Products and Services » Publications"
If you need to make sure your building infrastructure and systems are network-ready, see what CBRE’s new consulting service offers June 8, 2018 In "Products and Services » Services"
Rethinking the role of facilities managers—from cost reduction to organizational productivity December 2, 2018 In "Workplace Strategies » Workplace Evolutionaries"
See how this sleek desk lamp not only eliminates messy cables and joints but keeps your devices charged March 20, 2019 In "Products and Services » Lighting"
NeoCon 2018: “Space-as-a-service” — see how this Gold-winning enclosed workspace brings privacy with connectivity to commercial and public spaces June 20, 2018 In "Products and Services » Furniture & Furnishings"